What do we believe in? How do we go on? This is a painting Baz did yesterday, called “Perch: November 9, 2016” — from his newest series — because that’s what he did. Opening September 2, 2016: Basil King: Between Painting and Writing curated by Vincent Katz and Brian Butler, at the Black Mountain College Museum &Arts Center, Asheville, NC. Open until December 31, 2016. 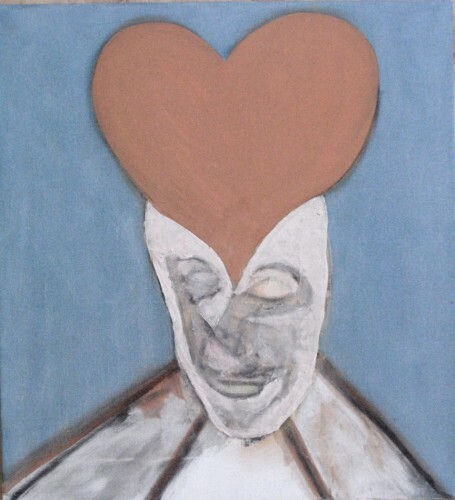 This show, will also include texts of King’s poetry and some of his covers for poetry books and journals, along with paintings using images from playing cards. Opening October 28, 2016: Basil King’s Birds curated by Tom Patterson, at St. Andrews University, Laurinburg, NC. Open until November 19, 2016. 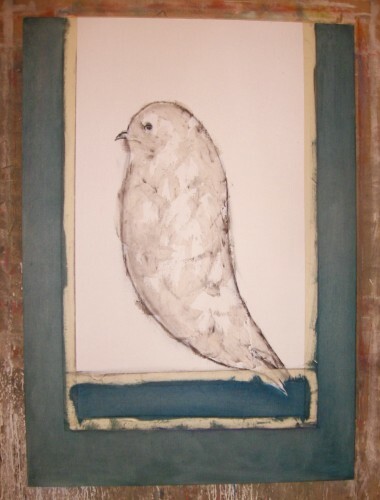 This show, focusing on King’s bird images, is part of a semester-long Black Mountain College Festival, with many exciting artists in residence for short visits. These two North Carolina events overlap for the duration of the St.Andrews show. Laurinburg and Asheville are 230 miles apart, a drive of about four hours. John Molloy Gallery, 49 East 78th Street, 2nd floor, New York. This will be the first solo New York exhibition of Basil King’s work since his historic exhibition of “Green Man” paintings at Poets House in 2010. 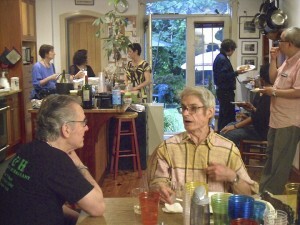 While I posted announcements on Facebook in October and had a marvelous send-off at the November 2015 Prose Pros reading series at Side Walk – aided by friends Vincent Katz, Mitch Highfill, Kimberly Lyons and Burt Kimmelman, who read excerpts from my work and their own autobiographical prose – I never posted the story on this blog. Spread in A Public Space, with my article and Lynn St. John’s photo. While the whole manuscript (all 300-plus pages of it) awaits a publisher, check out this issue. Not only for my stories, some sad and some glorious, with Basil King, Paul Blackburn, Dan Rice, Frank O’Hara, Lucia Berlin, G.R. Swenson, Robert Duncan, Jim Rosenquist and others, but also for the entire issue which has many special pleasures and rewards. I’m very happy to be in it. We are still at the same address, same website (www.basilking.net), same Flickr site for Basil King art. But a move is a move, whether cross-country or just from upstairs to downstairs. We have moved within our house, up to down, to top half, to bottom half, to all, and now back to half. Six different configurations since 1969… But (no surprise) it took most of a year to pack, sort, sell, give away, and throw out…all the familiar wrenching drill of moving. Now, we’re out of the top two floors, which have been converted into a nice apartment. No more stair-climbing. Plus improved income. Because while we we sat still, Park Slope became a pricey and desirable neighborhood. So desirable that we want to live here ourselves despite alluring offers from developers. Now I’m writing downstairs at the dining room table. Baz is writing in the living room where his desk fitted nicely. We have a few hideaways when we need more space for domestic life. In fact much of the house is mostly unchanged…except for Baz’s studio. That was the big rub. He’s now working in the front of what’s called in brownstones the parlor floor… Very narrow and about one-third of the size he was used to. Higher ceilings, yes. Skylight, no. But it works. For now. And since this April he’s been birding…18 are complete, as of today, September l6. 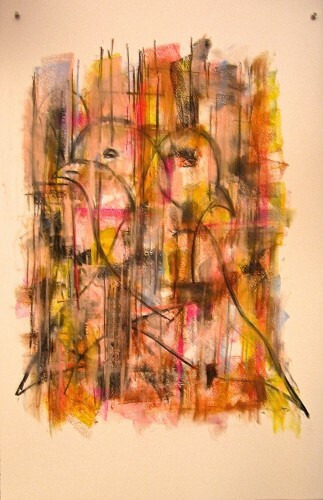 All on paper, most in mixed media. See one of them below. Do please visit the Flickr album called Bird Scripts. 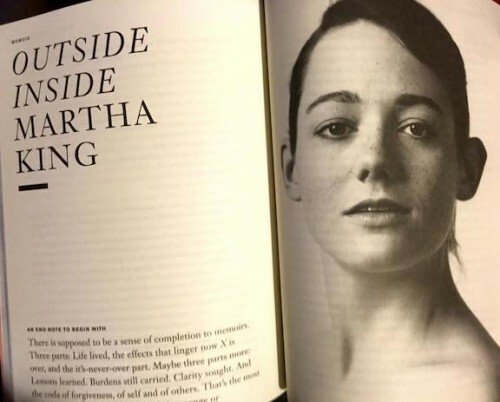 Meanwhile all summer I’ve been working with Brigid Hughes, the editor of A Public Space magazine (http://apublicspace.org/) on a very large condensed selection from my memoir, Outside Inside. It will be the feature of the fall issue. I’m certain to trumpet this news more and again–in October when the print copies are in my hand and again in November. The November 5th Prose Pros reading will be a celebration of the issue, with brief readings from all the devoted Friends of Basil King: Mitch Highfill, Vincent Katz, Burt Kimmelman, Kimberly Lyons, and me. A party after the move — it all looks the same downstairs. 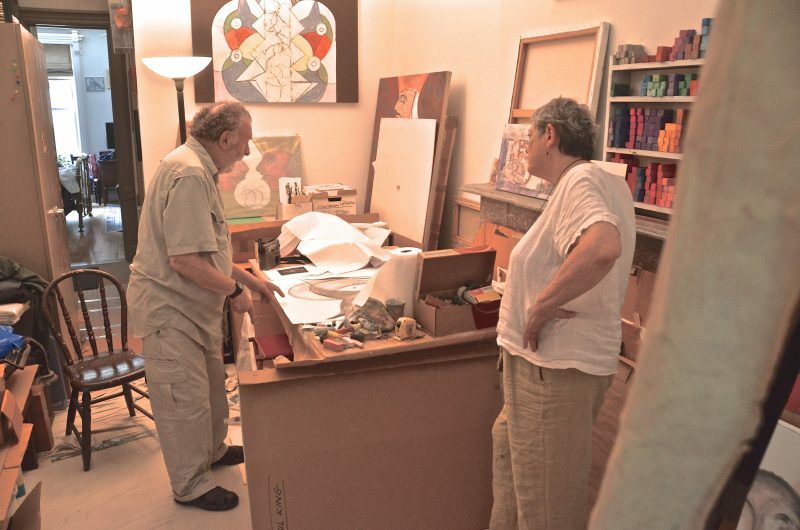 The Friends of Basil King will present “Basil’s Arc – The Paintings and Poetics of Basil King” at Anthology Film Archives, 32 Second Avenue at Second Street, New York City, on Saturday, September 22, 2012, from 12 noon to 6 pm. Sponsored by Lunar Chandelier Press — this free event includes conversations about King’s visual art illustrated by slides, with critics and poets including Edna Augusta, William Benton, Laurie Duggan, Tom Fink, Mitch Highfill, Vincent Katz, Burt Kimmelman, Harry Lewis, Kimberly Lyons, Tom Patterson, George Quasha, Corinne Robbins, Barry Schwabsky, Lilly Wei, and others…. Along with these discussions there will be performances of original music inspired by King images (“The Green Man” by Daniel Staniforth) and King text (“I Have a Little Song” from Mirage, by Nicole Peyrafitte). 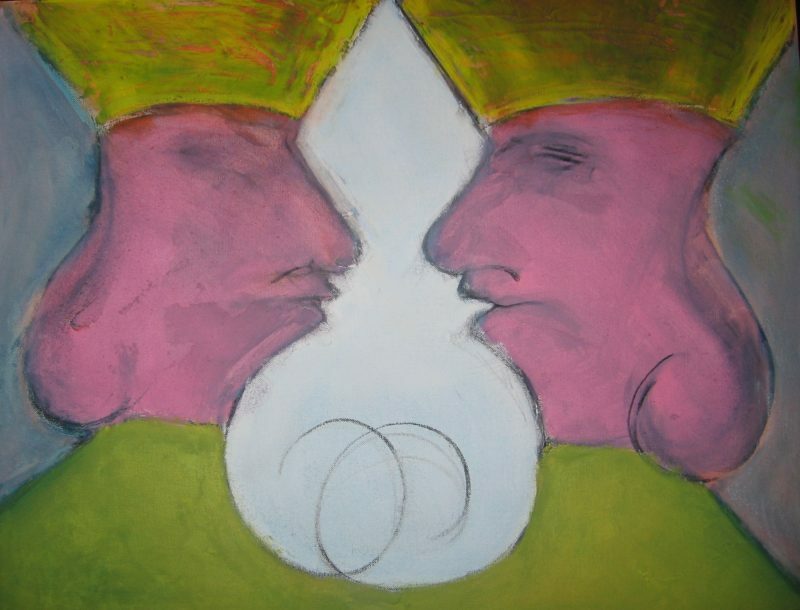 "Two Kings--Green" - from the King of Diamonds series, mm/canvas, 44" x 60", 2011, ©Basil King. Brief selections from King’s texts will be read by invited poets. The highlight of the event will be the debut screening of a 22-minute film portrait, Basil King: MIRAGE, commissioned by The Friends of Basil King, and created by Nicole Peyrafitte and Miles Joris-Peyrafitte. Save the date! You are invited! What is “The Friends of Basil King”? 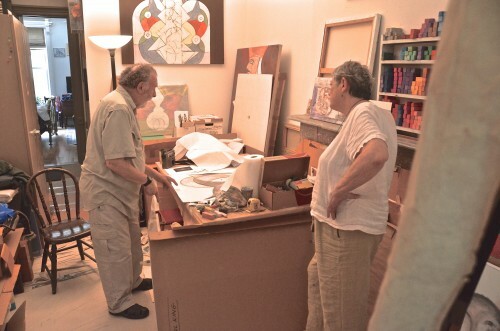 Lunar Chandelier Press is proud to present Basil’s Arc on September 22, 2012, in New York City – A consideration of the paintings and poetics of the painter/poet Basil King, now in his 77th year. The event will include the premiere of a film by Nicole Peyrafitte and Miles Joris-Peyrafitte, “Basil King: MIRAGE,” commissioned by The Friends of Basil King, performances of music inspired by King’s visual art, and discussions and presentations on the sources and implications of his aesthetics. Before I was approached, Kim had invited Vincent Katz and Mitch Highfill. I suggested adding Burt Kimmelman. And I joined in as a highly interested member.Vincent urged us not to create a huge committee because it would soon become way too hard to get anything decided. So we stopped here.